This multidistrict litigation arose from the 2014 recall by General Motors LLC (New GM) of General Motors (GM) vehicles that had been manufactured with a defective ignition switch, which could cause moving stalls and disable critical safety systems such as the airbag. After that recall, New GM recalled millions of other vehicles, some for ignition switch-related defects and some for other defects. The putative class plaintiffs sought recovery on behalf of GM car owners and lessors, arguing that they were harmed by, among other things, a drop in their vehicles’ value due to the ignition switch defect and other defects. While brand owners can be protected against reputational injury, the court here holds that a brand’s self-tarnishment provides its consumers no remedy. However, the court did allow certain claims to proceed, including claims for the value of time lost to repairs, and some state law claims if the relevant state allowed claims in the absence of a manifested defect; did not require a special trust relationship between the parties for a duty to disclose to arise; and/or permitted plaintiffs to plead both contract claims and unjust enrichment claims. Most of plaintiffs’ consumer fraud, fraudulent concealment, and breach of implied warranty claims survived, while most of their unjust enrichment claims didn’t. As the court noted, “most state courts construe their consumer protection statutes to permit recovery beyond actual damages, including incidental and consequential damages,” which would generally permit lost time claims. Nonetheless, plaintiffs who bought their cars before July 10, 2009—the date on which New GM purchased most of the assets of Old GM as part of the bankruptcy proceedings—couldn’t pursue claims for economic loss, because the economic injury took place at the time of sale. New GM’s alleged concealment of the ignition defect couldn’t cause economic injury to people who bought before New GM came into existence. Likewise, plaintiffs who sold, traded in, or returned their vehicles prior to New GM’s announcement of the recalls beginning in 2014 couldn’t pursue such claims. Because they didn’t own any affected GM vehicles at the time of the recall, they couldn’t suffer diminished value as the result of the market correcting for the true value of the defective vehicles. However, a plaintiff who bought her car after New GM bought GM and sold it before the recall was announced could still plead and prove damages in the form of out-of-pocket expenses and lost time, such as a plaintiff who experienced shutoffs while driving and had to go to the service shop often. Should Reese's object to the following description of candy molds? Agreed-on limits on advertising, like agreed-on limits on other inputs, risk being a per se violation of the antitrust laws. Here, a blanket ban, including a negative keyword requirement (so that someone bidding on "contacts" wouldn't get ads run against "1-800-Contacts" based on broad matching), was not justified by fear of trademark infringement/confusing consumers. The ALJ also notes that 1-800's extensive evidence that people often can't distinguish between organic and paid results has nothing to do with whether they can distinguish between results for 1-800 and results for its competitors. Initial ruling here. NB: I testified for the FTC, but the ALJ doesn't rely on my testimony. DHI and Oilpro compete in the market for websites for oil and gas professionals that include job postings. DHI filed a lawsuit against Oilpro and others asserting that the defendants hacked into their system, and Oilpro counterclaimed for DHI’s alleged copying from Oilpro’s own website, alleging multiple claims, which the court refused to dismiss on grounds that give lots of leeway to website owners to make breach of contract, copyright, CFAA, and DMCA claims. Copyright: DHI argued that Oilpro didn’t identify any material, information, or work that was both subject to copyright protection and actually copied by DHI. However, Oilpro alleged that it owned a valid copyright to its website and that DHI accessed it and copied data, member profiles, and other information from the website. Under the Twombly/Iqbal plausibility standard, it was enough to plead that the entire Oilpro website was an original work that includes a “distinctive page layout, design, graphical elements, and organization of member profile pages....” and that DHI “improperly downloaded data, member profiles, and other information from the Oilpro Website” and “then published information from the Oilpro Website on a website owned by DHI Group called Dice Open Web....” Since Oilpro alleged ownership of the entire website, and that DHI published Oilpro’s copied information on its own website, Oilpro stated a plausible claim for copyright infringement. [No no no—owning the overall layout doesn’t mean owning everything that might be copied. The proper allegation would be that DHI copied copyrightable elements.] DHI’s objections to the Magistrate Judge’s recommendation to deny its motion to dismiss the copyright infringement claim is OVERRULED. The court also denied DHI’s motion to dismiss Oilpro’s DMCA counterclaim because it alleged that it “had technological measures in place, including a robots.txt file, monitoring software, and firewall software, to prevent automated technologies from accessing the website” and DHI “circumvented these technological measures to access the Oilpro website and download material that was then published on [DHI’s] own website.” Specifically, robots.txt was plausibly a technological measure, as other cases have held. But note: The statute also requires that the measure “[e]ffectively controls access to a work” defined as a measure that, “in the ordinary course of its operation, require[ ] the application of information, or a process of treatment, with the authority of the copyright owner, to gain access to the work.” How does robots.txt require the application of information to gain access, as opposed to provide extra information to potential accessors? Trademark infringement: Oilpro successfully alleged that it had a protectable mark that DHI used to cause confusion about the authorization/sponsorship of the DHI site. [The court then proceeds to confuse nominative and descriptive fair use, applying the standards for descriptive fair use.] DHI argued that it used Oilpro’s mark to acknowledge Oilpro as the source of certain information, but the fair use defense was not available on a motion to dismiss because the complaint didn’t indicate on its face that DHI used the mark on its website in good faith—which, of course, is not an element of a nominative fair use defense. CFAA and the coordinate state Texas Harmful Access by a Computer (THACA): The court held that Oilpro’s allegations of a knowing violation of the terms and conditions of the website are sufficient to state a claim under both the CFAA and the THACA. On Prostate Review, Buckley wrote about his determination that his product was superior to Prostate Miracle because ProstaGenix contained almost twice as much Beta-sitosterol. He included Prostate Miracle’s ingredient list on Prostate Review (which the court suggests might be the source, however unjustified, of defendants’ “plagiarism” claim). Verified sought the TRO based on its claims for false advertising, defamation, trade libel, and unfair competition. The court found that falsity appeared likely, and that the allegedly false statements were material, because “statements that certain reviewers or distributors are fraudsters would be material.” Plaintiffs submitted evidence that Verified Nutrition exists as a Nevada limited liability company, disproving the claim that it is a “fake company,” as well as evidence that they spent approximately $150,000 in testing the ingredients of prostate supplements to review them on Prostate Report, which goes to the “fake review” statements. Thus, the court found likely success on the merits for false advertising, as well as for the defamation/trade libel claim, though I’m not sure where the special damages are alleged/proved—claims about general goodwill/reputation are usually insufficient to plead special damage. This is what happens when only one side shows up to litigate—which is why it’s good to be nervous about ex parte proceedings. Plaintiffs were also likely to succeed on their UCL claim. Balancing the equities/public interest. The harm to defendants seemed limited, “given they do not have a right to disseminate allegedly false statements.” As for the public interest, “while the public has an interest in not being exposed to false information, currently the public is able to view both Plaintiffs’ and Defendants’ advertisements regarding their respective prostate supplements, and can come to their own conclusions. Much of the information Plaintiffs use to demonstrate their claims are true and that Defendants’ are false, is also available on Plaintiffs’ website, Prostate Report, and thus also available to consumers to weigh the parties’ claims themselves.” This reasoning is interesting and troubling in equal measure; it seems to suggest that the parties ought to fight it out in the marketplace of ideas—but will consumers actually consult both websites? The answer might well be yes, if this is the kind of product that consumers do seek to educate themselves a bit about, but applied outside the TRO context it would seem worrisomely in conflict with the basic premises of false advertising law. However, applied to the ex parte TRO, where the speech ultimately might be true/nonactionable, caution is more understandable—and consistent with a First Amendment tradition of protecting speakers from speech-suppressive orders they have not been able to contest. 9th Circuit rules failure to recognize labeled ads as such "implausible"
And here’s a quote that defense lawyers will like a lot: “the assertion that consumers are not wise enough to recognize labeled advertisements for what they are, or to scroll down farther than the first three entries they see, is itself not plausible.” This indicates why the false advertising claim was doomed; Novation didn’t plead any literally or implicitly false statement by the ads, only that the separate entities didn’t advertise their affiliations. And it was implausible that consumers seeking to sell future payments from structured settlements would fail to exercise a relatively high degree of care in considering ads from structured settlement companies. Rejecting a number of district court decisions, the Ninth Circuit finds standing to seek injunctive relief under California consumer protection laws even when the named plaintiff now knows the truth: “A consumer’s inability to rely in the future upon a representation made on a package, even if the consumer knew or continued to believe the same representation was false in the past, is an ongoing injury that may justify an order barring the false advertising.” This case involves wipes advertised as “flushable” which allegedly are not. Davidson would like to buy truly flushable wipes, if such actually exist. The district court dismissed the complaint under Rule 9(b)) because it concluded that Davidson failed to adequately allege “why” the representation that the wipes were flushable was false; she didn’t allege that she personally experienced problems with her home plumbing or the relevant water treatment plant. The court of appeals reversed, finding her allegations sufficient and plausible. Davidson alleged that flushable means “suitable for being flushed,” requiring an item to be capable of dispersing within a short amount of time. This definition of flushable was supported by dictionary definitions and Kimberly–Clark’s own statement on its website that its flushable wipes “are flushable due to patented technology that allows them to lose strength and break up when moving through the system after flushing.” Davidson alleged that the actual wipes she purchased failed to “disperse and disintegrate within seconds or minutes” and “did not break up in the toilet bowl like toilet paper but rather remained in one piece.” To the extent the district court dismissed the original complaint because Davidson failed to allege facts “showing how she came to believe that the [Scott Wipes] were not ‘flushable,’ ” that was wrong, because the complaint otherwise satisfied Rule 9(b). The district court also held that Davidson didn’t allege damages, in that she hadn’t pled “facts showing that her use of the wipes damaged her plumping, pipes, or septic system.” But that wasn’t required—paying a premium for a falsely advertised product is sufficient harm to maintain a cause of action. Davidson alleged that, without the misrepresentation, she wouldn’t have bought the wipes or would have paid less for them; that was enough. Knowledge that the advertisement or label was false in the past does not equate to knowledge that it will remain false in the future. In some cases, the threat of future harm may be the consumer’s plausible allegations that she will be unable to rely on the product’s advertising or labeling in the future, and so will not purchase the product although she would like to. In other cases, the threat of future harm may be the consumer’s plausible allegations that she might purchase the product in the future, despite the fact it was once marred by false advertising or labeling, as she may reasonably, but incorrectly, assume the product was improved. Given Davidson’s allegations, she adequately alleged a desire to buy flushable wipes and an inability to rely on Kimberly-Clark’s representation of flushability, which was enough to constitute a “threatened injury [that is] certainly impending,” thereby establishing Article III standing to assert a claim for injunctive relief. Judge Berzon concurred, noting that the majority assumed that it was required to perform a separate standing analysis for each “form of relief.” She disagreed that this assumption was a requirement of the “case or controversy” requirement of Article III, and argued that it was instead “an artifact of the discredited practice of conflating the prerequisites for injunctive relief with the Article III prerequisites for entry into federal court.” Instead, “we have a single dispute—a single case, a single controversy—giving rise to multiple forms of relief.” Where “state law clearly envisions those remedies as the product of a single adjudication of a single issue,” to proceed otherwise in federal court “fundamentally undermines, substantively, the enforcement of state laws in federal court.” A remand to state court on injunctive relief alone was motivated by the same desire not to let defendants strip plaintiffs of their state-law remedies through removing a case over which there is clearly Article III jurisdiction, but was not an acceptable solution. Still, Judge Berzon concurred fully, recognizing that the 9th Circuit en banc opinion interpreting Lyons the other way does require a separate standing analysis with regard to prospective relief. Quidel is a “diagnostic healthcare manufacturer” that “developed, promotes and sells the Thyretain TSI Reporter BioAssay,” which is “intended for the qualitative detection in serum of thyroid-stimulating immunoglobins (TSI).” Quidel alleged that Thyretain “is the only commercially available assay that detects TSI only, as opposed to those that fail to differentiate between thyroid-stimulating and thyroid-blocking immunoglobins” (TBI), commonly known as “TRAb” assays. Siemens sells the IMMULITE 2000/2000 XPi TSI assay, which is intended to compete with Thyretain. In 2016, Siemens obtained FDA clearance to market IMMULITE, under a “substantial equivalence” finding through the Section 510(k) premarket notification process. Quidel cited seven scientific studies and alleged that IMMULITE detects both TSI and TBI, and therefore “compares similarly to other TRAb assays, detecting but not differentiating between stimulating and blocking antibodies.” E.g., one study found that while IMMULITE was “about as sensitive and consistent as the Thyretain bioassay,” it did not “consistently distinguish[ ] between stimulating and blocking activities in 20 selected cases of hypothyroid Hashimoto’s thyroiditis.” Thus, Quidel challenged Siemens’ claims about its ability to differentiate TSI from TBI, e.g., “Unlike TRAb (TSH receptor antibody) assays which detect both stimulating and blocking antibodies, the Siemens TSI assay specifically detects only thyroid stimulating antibodies, which are the hallmark of Graves’ disease.” The “only” claim was later discontinued (though the press release and marketing statements that included that word have not been removed from the web), but the current product description claims that IMMULITE detects TSI with 98.5% specificity, contrasting that to TRAb assays that detect both TSI and TBI, thus allegedly implying that IMMULITE is TSI only. (What I can't tell from the specificity claim, and I haven't looked up the underlying documents, is whether this applies when there's TBI but not TSI present, which would affect how similar IMMULITE is to Thyretain.) Given that IMMULITE costs less and works faster than Thyretain, Quidel alleged that this falsity caused it damage, including the loss of at least one lab customer at a cost of $250,000 a year and corrective advertising costs. The court found that Quidel had sufficiently pled falsity and misleadingness to satisfy Rule 9(b) for its Lanham Act and California state law false advertising claims, as well as with intentional interference with economic advantage. Likewise with materiality for false advertising: given the alleged cost and time differences, it is reasonable to infer that an equivalence claim would influence purchasing decisions. Siemens argued that materiality was inadequately pled because labs are sophisticated parties and are required to independently verify an assay’s performance data, but that’s a matter of reliance at most, not materiality. Pull quote: “[C]onsumer protection laws should encourage accurate representations of contemporaneous scientific knowledge, rather than lucky guesses about the state of scientific knowledge in the future.” Amen. of when corporate speech about science is misleading. mischaracterize scientific knowledge is not participating in scientific discourse. misleading speech onto the public. Fast Company has a great story about the intricate operations and arguable shenanigans of mattress reviewers who are also paid affiliates. J. Crew maintained in a previous lawsuit that the Valued At price represented the price at which other retailers offered the same or similar goods. Delman hired an expert who investigated to see whether the same or similar goods were available for purchase from other retailers at or around the Valued At price, but did not find comparable goods available at the Valued At price. Instead, many (if not all) of the goods could be bought at or below the Your Price price. The court found that Delman’s allegations satisfied Rule 9(b), both as to the implied discount-from-regular-J. Crew claim and the “Valued At means prevailing market price for a similar item” theory. J. Crew argued that her decision to plead two theories of deception made her allegations fatally vague, but “there is no reason why a pricing scheme that is purposely ambiguous could not also be deceptive or misleading.” If a reasonable consumer could interpret the Valued At price to mean one of multiple, mutually exclusive things, all of which are untrue, that states a claim. Plaintiff did fail to provide proper notice as required to bring a breach of contract claim in California, and also had to wait to bring a CLRA claim given the notice requirement of the CLRA. J. Crew argued that Delman suffered no damages, because she received the goods that she paid for at the agreed-upon price. But courts have rejected this argument under California law. “[A] bargain hunter is, in fact, economically harmed when the seller inflates the perceived value of its products” (citing Hinojos v. Kohl’s Corp., 718 F.3d 1098 (9th Cir. 2013)). Finally, J. Crew argued that Delman lacked standing to seek injunctive relief because she no longer risked being deceived by J. Crew’s deceptive pricing. However, Delman alleged that she would purchase more apparel from J. Crew if it were to cease making its false representations. The issue wasn’t whether policy concerns for the enforcement of California law could trump Article III, but rather that Delman alleged irreparable injury in the future: she couldn’t ascertain, from J. Crew’s pricing scheme, the true value of the items she’d like to buy, and thus she can’t trust its bargain claims. This continued inability to trust was a sufficient likelihood of future injury to confer Article III standing. 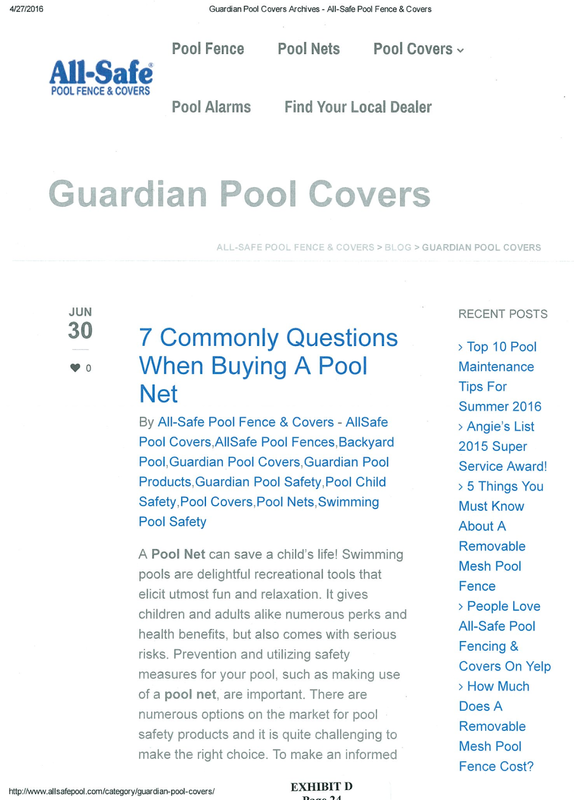 Guardian and All-Safe compete in the market for mesh pool fences; a Guardian fence costs around $2,000, and an All-Safe fence costs around $1,500. The parties previously litigated keyword ad buys, but dismissed the litigation. In 2016, a potential Guardian customer reportedly said that he had seen the Guardian name in numerous places on All-Safe’s website and asked if the two companies were related. As a result, Guardian found that its name appeared on All-Safe’s website in several places. “Guardian Pool Covers,” “Guardian Pool Safety,” “Guardian Pool Fence,” and “Guardian Pool Products” all appeared as “Topics” listed in the right hand column of All-Safe’s website, along with many other topics such as “Swimming Pool Safety.” Each topic had its own page collecting all of the posts tagged with that specific topic. Each post had a “by” field, which All-Safe used to insert topic labels. 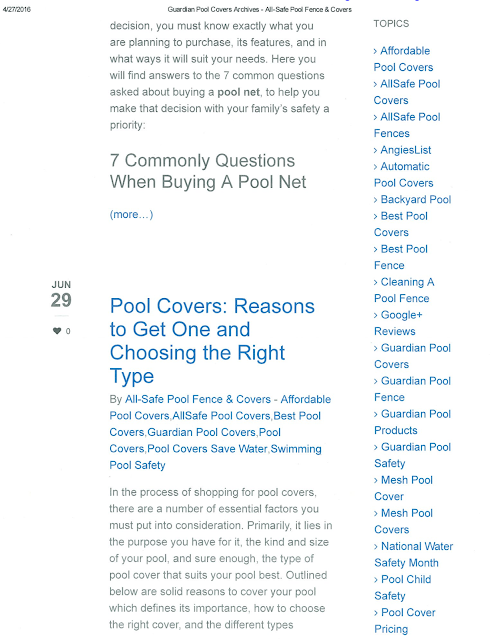 Guardian argued that this practice suggested that Guardian had authored the posts, but the court disagreed, given that other “by” entries included “Removable Mesh Pool Fence” and “Swimming Pool Safety.” The Guardian-tagged posts didn’t discuss Guardian, but were generally about pool safety, and they didn’t offer products for sale. All-Safe said that it didn’t authorize the Guardian tags, but that its third party vendor created them without specific authorization, and they were removed shortly after this litigation began. The Guardian topic pages were viewed 17 times total by 5 unique users, presumably some of them Guardian’s counsel; 17 views was less than .01% of all All-Safe website traffic. As for the keyword aspects of the case, from January 2008 until February 2011, All-Safe used “guardian pool fence” as a search term targeted at Spain, Portugal, Puerto Rico, and Costa Rica, resulting in four clicks. These campaigns ended in February 2011. From January 2008 to May 2016, All-Safe’s AdWords campaigns together generated well over 800,000 clicks. Also, for a few months in 2016, Guardian included “all safe pools” in its Google AdWords, along with eighteen other search terms, several of which included the term “all safe” or “all-safe,” though Guardian argued that this was inadvertent and in contravention of its standard practice. In May 2016, a search for “all-safe” returned an ad for Guardian with the headline “all safe pools – Guardianpoolfence.com.” “All safe pools” generated six clicks on Guardian ads. The consumers here would be careful and accustomed to shopping online, given the cost of the pool nets. What would such customers understand? The fact that a single consumer might potentially have been confused—the one who talked to Guardian’s VP—was insufficient to show likely confusion, especially given the hundreds of thousands of views of All-Safe’s website. 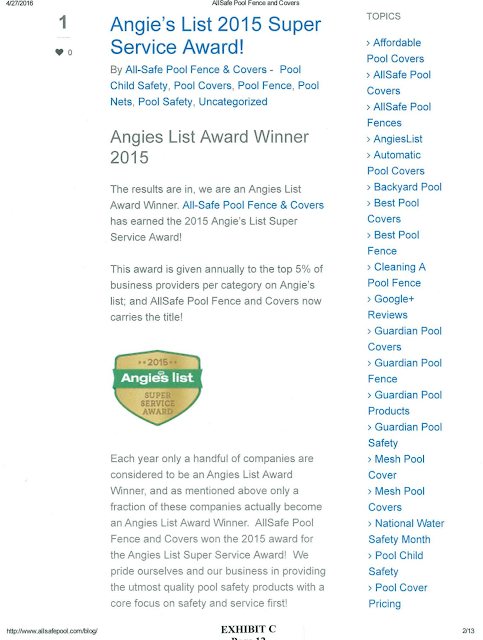 All-Safe’s website prominently displayed its logo, and only its logo, on every page. “This ‘broader context’ of the topics pages mitigates against any possible confusion as to a connection with Guardian.” Summary judgment for All-Safe. All-Safe counterclaimed based on Guardian’s use of “all safe” or “all-safe” in Google AdWords. However, as All-Safe itself said, “there is growing consensus in the case authorities that purchasing trademarked keywords for the purpose of competitive keyword advertising does not violate the Lanham Act.” Guardian didn’t use the All-Safe mark on its website or the phrase “all safe” in its domain name. Plus, clear labeling of a search result as an ad “can help eliminate any possibility of confusion.” Interestingly, the court applied this principle to an ad whose text arguably used both All-Safe’s mark and Guardian’s mark, which not all courts would—the court thought that clear marking as an ad was enough of a signal that consumers might get competing information. Even though All-Safe’s trademark appeared in the ad, it “also clearly incorporated Guardian’s non-infringing domain name,” and thus Guardian’s ad wasn’t likely to confuse. Plaintiffs alleged that Green’s SnoreStop, a homeopathic remedy for snoring, was a sugar pill falsely advertised to stop snoring. Although the trial court found the testimony of Green’s homeopathy expert was not credible and gave it no weight, the court also concluded that plaintiffs failed to meet their burden of proof on their UCL, FAL, and CLRA claims, noting they “proceeded on the theory that there is no scientific basis for the advertised efficacy of SnoreStop” but “provided no evidence of tests to determine the efficacy of SnoreStop.” The court of appeals reversed, implicitly rebuking a number of recent cases that have (wrongly) interpreted California’s standard—which does not allow private plaintiffs to require substantiation from defendants—as precluding claims by private plaintiffs that rely on evidence that shows no scientific support for the defendant’s scientific claims. Green claimed that a clinical study showed that 79.5 percent of SnoreStop users reported noticeable improvements within the first five nights, but the study, according to plaintiffs, didn’t support the findings attributed to it and “is instead characterized by severe methodological deficiencies.” SnoreStop allegedly “simply consists of a myriad of toxic substances that are provided in such extremely diluted form that they have no impact on the human body whatsoever.” Homeopathy relies on dilution, and of SnoreStop’s seven “purportedly active ingredients,” five were diluted to one part per million, one of to one part per ten thousand and one part per million, and one to one part per trillion. Plaintiffs’ expert was Dr. Lynn Willis, who has a Ph.D. in pharmacology. Willis testified about the two fundamental principles of homeopathy—the law of similars (treat a disease with substances that cause symptoms mimicking the disease) and the principle of dilution (diluting drugs makes them more powerful). Willis testified he was not aware of any valid scientific support for dilution, which is in direct opposition to dose response theory, the basic principle of pharmacology. The theory of homeopathy is that tapping the diluted solution against a hard surface causes a release of healing energy, but this has never been detected. Based on his education, training, research, and scientific review of homeopathic literature, Willis opined that the homeopathic law of similars is “not compatible with conventional theories of how drugs and other medications work,” and was contrary to proven scientific theory, as was dilution. He also specifically addressed each of SnoreStop’s seven “active” ingredients (including belladona) and their dilution levels. He testified that each ingredient would not, in isolation, relieve snoring, and that he was unaware of any credible scientific evidence to support the claim that the combination, at that dilution level, would be able to shrink swollen tissues that block air passages (as claimed by defendant). He further testified that defendant’s clinical study was unreliable: among other things, it relied on snorers’ bedmates’ opinions, and it failed to include a power analysis to figure out how many subjects would be needed to detect a real difference. The study also showed that 45% of the placebo group showed a reduction in snoring, meaning that the test group was also likely responding due to placebo response. The net improvement that should have been attributed to the treatment group was thus 20.4%, and he concluded that the study should not be relied on to claim efficacy for SnoreStop. Plaintiffs’ evidence also included the named plaintiff’s testimony about her own experience with SnoreStop and its inefficacy for her. At the close of plaintiffs’ case, Green moved for judgment as a matter of law, which was denied. Green called, as an expert on homeopathy, Gregory Dana Ullman, who testified that he practiced homeopathy and had written hundreds of articles on homeopathy. He testified that he believed all of the statements at issue on the SnoreStop package label were accurately stated and correct. After closing arguments, the court concluded that plaintiffs failed to meet their burden of proof, because Dr. Willis couldn’t testify to the product as a whole, and thus there was insufficient evidence that the combined ingredients failed to work. As to the study, the court found that Dr. Willis hadn’t conducted counter-testing of his own or proved that the study was flawed. However, the court found Ullman’s testimony not credible and entitled to no weight, in part because of his support for the use of a radionics machine, whereby a physician puts a picture of his patient on one side, and a few medicines on the other side, and then sees which of the medicines the needle points toward. When the trial court concludes that the party with the burden of proof failed to carry that burden, the question on appeal is whether the evidence compels a finding in favor of the appellant as a matter of law. This requires a finding that appellant’s evidence was (1) “uncontradicted and unimpeached” and (2) “of such a character and weight as to leave no room for a judicial determination that it was insufficient to support a finding.” A trier of fact isn’t automatically required to give a verdict that conforms to expert opinion, even if unanimous; the value of the expert opinion depends on the quality of the evidence the expert provides. The trier of fact can only be reversed unless it could not, in light of the record, reasonably reject the expert’s testimony, which was the case here. “Willis’s expert testimony regarding the efficacy of SnoreStop was uncontradicted and unimpeached and constituted ample proof that SnoreStop is not an effective snoring remedy.” Willis had relevant training and expertise; he testified that there was no valid scientific support for the dilution theory, and that it contradicted dose response theory, “the basic principle of pharmacology. Willis also testified that he had never detected any evidence to support the homeopathic idea that striking a substance releases healing energy, noting that ‘science has no way to measure this energy.’” Thus, he opined that homeopathic theories were “contrary to proven scientific theory.” This testimony was unimpeached and uncontradicted; the trial court gave Green’s witness testimony no weight. And uncontradicted and unimpeached testimony of an expert witness may not be “arbitrarily disregarded” by the trier of fact. Moreover, his testimony wasn’t limited to homeopathy in general, because he also testified about the inefficacy of each of SnoreStop’s “active” ingredients and the inefficacy of those ingredients in combination. The trial court mischaracterized his testimony in stating that Willis “could not testify as to the product as a whole.” But he testified that each ingredient wouldn’t work, and that he wasn’t aware of any credible scientific evidence that the combination would work and that he was of the opinion that they wouldn’t. Also, though the court stated that plaintiffs didn’t prove that Green’s cited study was flawed, Willis testified about a number of flaws in the study. Contrary to the trial court’s statement, plaintiffs provided scientific evidence to support their theory that there is no scientific basis for the advertised efficacy of SnoreStop. The trial court based its holding largely on plaintiffs’ lack of tests on the actual SnoreStop tablets. But Willis “was entitled to accept the information on the label and could competently testify that given that information, there is no scientific basis to conclude that SnoreStop could have any effect on snoring beyond a placebo effect.” An expert’s opinion is not unreliable simply because the expert’s opinions are based on data collected by others. Because Willis’s reasoning, qualifications, or credibility were unchallenged, the rejection of his opinions was arbitrary. Finally, the trial court’s apparent decertification of the class was in error; there was no indication that the requirements for certification were no longer satisfied at the time of trial. The trial court was directed to determine the damages, restitution, and other relief to which the plaintiff class members were entitled. Reybold sued the Does for infringement, dilution, injurious falsehood, and defamation based on their statements on ApartmentRatings.com about Reybold’s St. Andrews Apartment Complex, and made an ex parte motion for discovery. Reybold wanted to issue a third-party subpoena to ApartmentRatings.com seeking, among other things, the IP addresses from which the online postings originated. Reybold planned to then subpoena the relevant ISPs associated with those IP addresses, in order to identify names, payment information, and other identifying information associated with those addresses. The court, rightly, denied the motion. I would in no way recommend this complex. Apartments are old, lawns are always trash covered, cigarette butts and dog crap everywhere. Trash areas are always a mess. Maintenance stuff never gets done. When it does they have to come back 3 or 4 times. My rent goes up every year and new people get deals, yet I get nothing for staying. I’m out of here this year. There is tons of new stuff around that is cheaper. Rock wood, Emblem, check these out. So much nicer for less money. Also, my UPS and FedEx packages are always getting stolen from my door and they don’t do anything about it. Good Riddance $hlt Andrews. I’ve been living at this place with bad wiring for months now and no one seems to care. I have several outlets that spark when I use them, some that don’t work at all, and one that only works when you tap on it. The wiring in my home is obviously not right. I have been begging them to fix it and they keep telling me they’re trying to get an electrician out to look at it but no one ever shows. I have children and I should feel safe having them live her[e] but I don’t. But let me pay rent one day late and they’re all over me. I hate this place. Expedited discovery requires the party seeking discovery to demonstrate that its request is “reasonable” in light of the relevant circumstances. Where such discovery is sought in order to identify unknown or anonymous John Doe defendants, courts first ask whether the plaintiff has established a prima facie case for each essential element of the claim(s) in question. If so, courts have asked whether the plaintiff has demonstrated: (1) that it has no other way to identify the alleged wrongdoers, aside from obtaining the discovery at issue; or (2) that expedited discovery is necessary because evidence identifying the defendants may be otherwise destroyed (e.g., as a result of routine deletion by third party ISPs). Good cause can exist in these cases, although courts will still consider other protections for defendants from misuse of their personal information. The court looked at the Lanham Act claims first, since they provided federal subject matter jurisdiction. There was no suggestion of false association in the complaint; claims for “Unfair Competition” and “Commercial Defamation” were both really false advertising claims. Reybold failed to sufficiently allege commercial advertising or promotion: that the reviews were commercial speech, that they came from a defendant in commercial competition with Reybold [note that this should have been replaced with the Lexmark standard, but it makes no difference], or that the speech was made for the purpose of influencing consumers to buy a defendant’s goods or services. Seven of the 14 challenged posts were listed as being written by a “Resident” or “Prospective Resident[,]” and all 14 postings either directly state or very strongly imply that the poster currently lives in, has previously lived in, or was thinking of moving to St. Andrews. No post was explicitly identified with a competitor; one post mentions competitors, but still claims to be from a renter making comparisons. And no other facts were pleaded to explain why the posts could plausibly be from competitors. Given the lack of a prima facie federal claim and the apparent lack of subject matter jurisdiction, the court denied Reybold’s motion for expedited discovery. Akeem Daniels, Cameron Stingily, and Nicholas Stoner played college football and sued FanDuel and DraftKings for violating their Indiana right of publicity. Defendants run fantasy sports websites and mobile apps; they assemble a group of select collegiate players—including plaintiffs—to appear on a list of available athletes, and they assign each player a fictitious “salary.” A customer can then buy the services of individual athletes, and each athlete on the fantasy team scores a certain number of points in each contest based on real-life performance. Defendants allegedly generated roughly $3.0 billion in customer entry fees in 2015, and used athletes’ names and likenesses in marketing. 1. The use of a personality’s name, voice, signature, photograph, image, likeness, distinctive appearance, gestures, or mannerisms in material that has political or newsworthy value. 2. The use of a personality’s name, voice, signature, photograph, image, likeness, distinctive appearance, gestures, or mannerisms in connection with the broadcast or reporting of an event or a topic of general or public interest. 3. The use of a personality’s name, voice, signature, photograph, image, likeness, distinctive appearance, gestures, or mannerisms in literary works. 4. The use of a personality’s name to truthfully identify the personality as the performer of a recorded performance. Newsworthiness is broad under Indiana law. As a 1993 federal court applying Indiana law wrote, “The privilege of enlightening the public is by no means limited to dissemination of news in the sense of current events but extends far beyond to include all types of factual, educational and historical data, or even entertainment and amusement, concerning interesting phases of human activity in general.” Plaintiffs argued that this 1993 case was inapplicable because it was decided prior to the enactment of the ROP statute. But, of course, that’s exactly why it applies—“[t]he legislature is presumed to know the common law and to incorporate it into the statute except where it expressly indicates otherwise.” Plus, a contrary holding would raise significant constitutional issues, so avoidance supported a broad interpretation as well. Given the breadth of the exception, plaintiffs’ athletic achievements and activities were newsworthy. For the same reasons that the defendants’ materials were newsworthy, they were also matters of public interest. But the public interest exemption requires use “in connection with the broadcast or reporting of an event or a topic.” Defendants argued that their websites “report” information about college sports, because they profile players on their websites; “corral [the] week’s news, notes and injury updates;” and disseminate performance information. But they also allow customers to create fantasy football teams. The Ninth Circuit, in In re NCAA Student-Athlete Name & Likeness Licensing Litig., 724 F.3d 1268, 1271 (9th Cir. 2013), considered a similar challenge raised by former student athletes to a video game, which allowed individuals to “control avatars representing college football players as those avatars participate in simulated games,” and ruled that the material at issue did not constitute “publishing or reporting.” However, it also distinguished the video games from the C.B.C. fantasy baseball case because video games use “virtual likenesses” rather than just performance and biographical data. Here, defendants’ websites could be used as “reference sources,” “either for purposes of playing the associated game, or for information about the collegiate sports and athletes represented on the websites.” This was a close call, but given the policy of defining reporting broadly/constitutional avoidance, the court found that the materials were “reporting” and defendants also won their motion to dismiss on that ground. That was good, because they fared less well on their other objections, which the court presumably addressed to save time after the inevitable appeal. DraftKings argued that its contests fell within the “literary works” exception. Other courts have determined that video games are literary works for similar purposes, and websites are literary works under the copyright law. However, for the publication/reporting exception, DraftKings tried to distinguish itself from video games, and it also didn’t explain why “the particular features of fantasy sports competitions are similar to the video games that courts have determined constitute literary works.” This created factual issues not suitable for resolution at the motion to dismiss stage. The court also declined to recognize a First Amendment defense at this stage, because it wasn’t clear (among other things) whether defendants’ speech was noncommercial. In classifying whether “mixed” speech should be classified as commercial or non- commercial, the Seventh Circuit has highlighted the following relevant considerations: “whether (1) the speech is an advertisement; (2) the speech refers to a specific product; and (3) the speaker has an economic motivation for the speech.” [But not all speech offered for profit is “mixed” speech—I doubt the court would think that a (non-sponsored, I have to add) NYT article or editorial was “mixed” speech even though the NYT seeks to make a profit. The court thought it couldn’t figure this out at the motion to dismiss stage, even though the pleading itself apparently distinguished between defendants’ ads and the service defendants sold, so I’d say this could be done on a motion to dismiss. The court also rejected defendants’ copyright preemption argument, because the Seventh Circuit’s holding in Toney indicates that persona (etc.) isn’t copyrightable subject matter because it can’t be fixed. It may be that a person’s likeness can’t be fixed in a specific photo, but if she uses the same name through time I can’t see what’s so unfixable about the name; I guess the argument must be that the name is just the manifestation of the unfixed persona which is really what the ROP protects. Still, that name is fixed in a tangible medium, like other uncopyrightable stuff as to which state-law protection is preempted. Sigh. The parties disputed whether Rule 9(b) applied, requiring the claims to be pled with particularity. Courts have divided both for §349 and FDUTPA. The court here reasoned that plaintiffs’ claims weren’t “premised on allegations of fraud,” as they didn’t claim actual reliance or knowing intent to induce reliance. Thus, the court concluded that only Rule 8(a) applied. Second, plaintiffs alleged that Kate Spade “touted its artificially inflated former ‘our price’ price as a value anchor to create the illusion of greater” quality, even though “the Outlet Merchandise was of inferior quality.” It was plausible that the “Our Price” labels conveyed an implicit message of quality and that that message is false or misleading. By alleging that the goods they purchased at the Kate Spade outlets were worth less than than the “discounted” prices they paid, plaintiffs alleged a plausible, and cognizable, injury. The FTC allegegd that “the researchers conducted more than 30 post hoc analyses of the results looking at data broken down by several variations of smaller subgroups for each of the nine computerized cognitive tasks,” and that post hoc subgroup analysis “greatly increases the probability that the statistically significant improvements shown are by chance alone.” As a result, “the few positive findings on isolated tasks for small subgroups of the study population do not provide reliable evidence of a treatment effect.” Further, plaintiffs alleged that Quincy’s theory was that apoaequorin enters the human brain to supplement endogenous proteins that are lost during the natural process of aging, but there are no studies showing that orally-administered apoaequorin can cross the human blood-brain barrier. Instead, Quincy’s studies allegedly show that orally-administered apoaequorin is rapidly digested in the stomach and broken down into amino acids and small peptides like any other dietary protein. In a footnote, the court said that these studies were “contradicted by canine studies whose relevance plaintiffs challenge,” and also that the FTC’s argument “loses force when applied to the results of the subgroup study which make it clear that something caused a statistically significant difference between those subjects who took Prevagen and those given a placebo” (emphasis added). And here, in the footnote, we have the core of the problem: that “something” causing the statistically significant difference is, at a minimum, plausibly random error. When you analyze 20 different subgroups, and one of them shows a statistically significant difference at the .05 confidence level, that is exactly what you would expect when the hypothesis that there is no effect is true: 19 out of 20 times, experimental results from the sample match underlying truth, and 1 out of 20 times they don’t. That’s literally (numerically) what .05 confidence means. And it’s also part of why post hoc subgrouping is so risky and potentially misleading: once you slice and dice, you have decreased your sample size and increased the chances of getting a false positive. If the only evidence you had were from the subgroup, then yes, the results support the hypothesis of efficacy, but you can’t ignore that you also have the evidence from the other subgroups. Moreover, a related reason why post hoc subgrouping is dangerous is that it’s post hoc because you had no preexisting reason to suspect a difference in reaction to the test substance. Occam’s Razor works well here: the simplest and most plausible explanation is that the subgrouped results, which aren’t even for the same cognitive tasks across groups (thus making a posited mechanism other than random error even harder to come up with), are positive as a result of random error. This is why lawyers desperately need statistics classes. The court thought that the FTC’s post hoc argument was merely theoretical. “They say that findings based on post hoc exploratory analyses have an increased risk of false positives, and increased probability of results altered by chance alone, but neither explain the nature of such risks nor show that they affected the subgroups performance in any way or registered any false positives.” When I was in practice, we had a case where we ended up having a math professor testify. He concededly had absolutely no expertise in trademark law, or surveys, or drug errors, but he was really helpful in explaining statistics, and why a supposedly positive result from a “confusion analysis” didn’t mean that confusion was likely. (Bayes’ theorem, so useful.) Given the substantiation standard and the other evidence from the study as a whole and the evidence about the blood/brain barrier, it is at least plausible that the positive results were false positives. Perhaps that could be refuted by replicating the study and seeing whether the same subgroups and tasks show up as significant, as a start. The court thought there was no “reason to suspect that these risks are so large in the abstract that they prevent any use of the subgroup concept, which is widely used in the interpretation of data in the dietary supplement field.” Even if that’s true, (a) what is the court doing deciding this on a motion to dismiss? And (b) post hoc subgrouping is a very different animal. There’s a very good book about this, Richard Harris’ Rigor Mortis, which I highly recommend to the interested. Still, “[a]ll that is shown by the complaint is that there are possibilities that the study’s results do not support its conclusion,” which isn’t enough for plausibility. The court dismissed the coordinate state law claims to be renewed (I hope) in state court, if not on appeal. Fan Fi International, Inc. v. Interlink Prods. Int’l, Inc., 2017 WL 4293144, No.16-cv-00661 (D. Nev.
After being sued in New Jersey, Fan Fi and ETL sued Interlink in Nevada for false advertising under the Lanham Act and deceptive trade practices and unfair competition under Nevada law, alleging that some of Interlink’s showerheads violated federal regulations because they permitted a flow of greater than 2.5 gallons per minute at 80 pounds per square inch when the flow restrictor was removed and that the flow restrictors could be removed with less than eight pounds of force. False advertising claims can’t be based on unsettled regulatory provisions. The court found that the force test regulation was ambiguous. The Department of Energy itself—the promulgating agency—expressly stated in the Federal Register that the meaning was so unclear that DOE had yet to establish a test method to determine whether a shower head satisfies the test. Though the 8-pound requirement is clear, the method by which resistance to removal was to be tested was unclear (e.g., what angle should the force be applied from). Fan Fi previously alleged that Interlink advertised a 100,000-hour lifespan, exceeding typical industry claims of 25,000-to-50,000 hours, and argued falsity because this claim would take 11 ½ years to substantiate and unidentified consumers had complained that the LEDs failed in as little as two weeks. The court previously dismissed, with leave to amend, reasoning that a claim of product life could be based on a reasonable estimate, and that isolated instances of product failure did not show falsity. To plead falsity required something objective, “e.g., a mechanical comparison of Defendant’s LED system with an LED system of known lifespan” or the like. Fan Fi now alleged that another entity tested one of the showerheads, finding a lifetime of 199 hours. The allegations continued that the LED system comprised a motor that generates power to the LED light from the movement of water through the showerhead, and that this motor lasts for several hundred or several thousand hours, meaning that 100,000 hours wouldn’t be possible for the system. Interlink argued that there was no indication of expert testing or testing of more than one unit, but that didn’t matter at the pleading stage, where plausibility could be achieved by alleging testing and an explanation of mechanical characteristics that made the ad claims likely impossible. Brickstructures, a LEGO-structure-creating business, sued Coaster for breach of contract, breach of fiduciary duty, and false advertising under the Lanham Act. Given that the complaint’s allegations of diversity jurisdiction were insufficient, the court looked at the Lanham Act claims. Brickstructures’ founder conceived of the idea of a brick-based roller coaster many years ago. He began by adapting a piece from a model roller coaster kit sold by Coaster, which used glue and not LEGOs, then reached out to Coaster to propose a possible partnership. The parties agreed to collaborate and their joint venture began a small production run of a brick-based roller coaster. After a thousand kits were made and sold, Brickstructures alleged, Coaster remitted far less than Brickstructures was due, and then stopped communicating. Coaster then launched a successful Kickstarter campaign for a nearly identical toy. The allegedly false claims were that Coaster’s solo kit, the Cyclone, was the first commercially available kit combining the leading block system with the Coaster Dynamix track system, that it was the first brick-based roller coaster of its kind and the first commercially available brick compatible roller coaster construction toy, and that it was created by the Coaster Dynamix team. Are Crocs' uniqueness claims a crock?